We propose a test generation strategy from natural language (NL) requirements via translation into Colored Petri Nets (CPN), an extension of Petri Nets that supports model structuring and provides a mature theory and powerful tool support. This strategy extends our previous work on the NAT2TEST framework, which involves syntactic and semantic analyses of NL requirements and the generation of Data Flow Reactive Systems (DFRS) as an intermediate representation, from which target formal models can be obtained for the purpose of test case generation. Our contributions include a systematic translation of DFRSs into CPN models, besides a strategy for test generation. We illustrate our overall approach with a running example. We thank Embraer for the partnership related to the NAT2TEST framework and, particularly, Braulio Horta and Ricardo Filho for their valuable contribution. 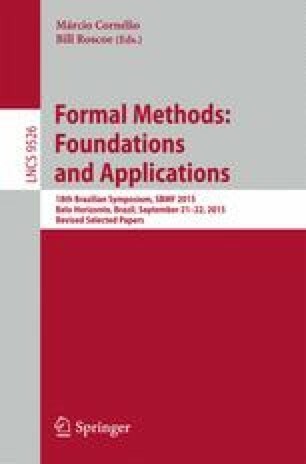 This work was supported by the National Institute of Science and Technology for Software Engineering (INES (www.ines.org.br)), funded by CNPq and FACEPE, grants 573964/2008-4 and APQ-1037-1.03/08.